If there is one type of book that is truly helpful to have in your own personal craft library, it’s a book of crochet borders. Borders can be added to every single crochet project to make the item more unique, personal, detailed and interesting. Borders can also be added to readymade fabric items such as towels, pillow cases and flannel fabric to quickly create one-of-a-kind handmade items. 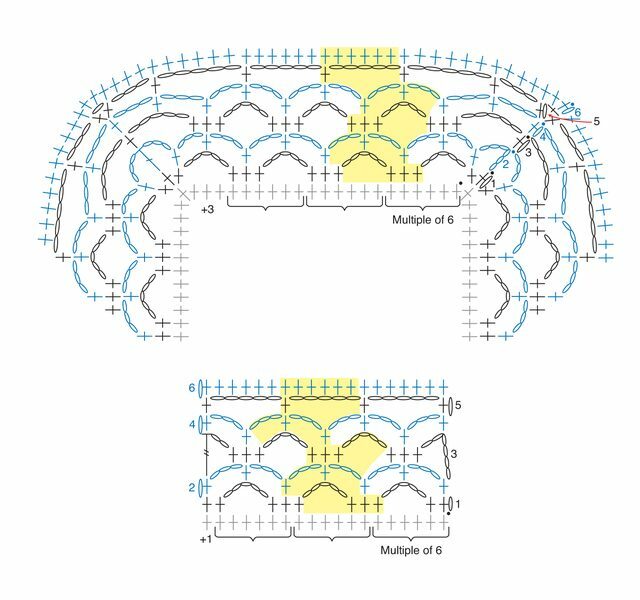 Every Which Way Crochet Borders provides detailed instructions (including photos and symbol charts) for more than 130 different original designs. That’s right; these are all original designs; none of these are repeats of the borders already showcased in Edie’s amazing book Around the Corner Crochet Borders. There is a lot of helpful information throughout this book. For example, you’ll find tips on how different borders look when worked in different yarn weights. You’ll get a great education in complementary vs. contesting borders, color and scale choices for borders, and how to work into different types of fabrics (such as knit). Edie shares how to get the right stitch count, even if you have to fudge it a little, for your borders. The borders in the book are enough to get you to buy it but the extra info is a nice bonus. 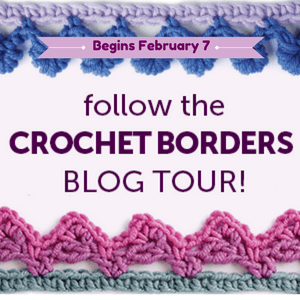 A huge thanks to the author and publisher for allowing me to share one of the free crochet border patterns from this book with you today. Each pattern in the book is labeled to highlight its features; this one (#71) is reversible, medium, straight and open / lacy. Base rnd, each side: Multiple of 6 + 3 + corners. Begin in corner st. This giveaway is limited to US entries only. Giveaway closes 2/17/17. Winner will be notified shortly after by email or social media. 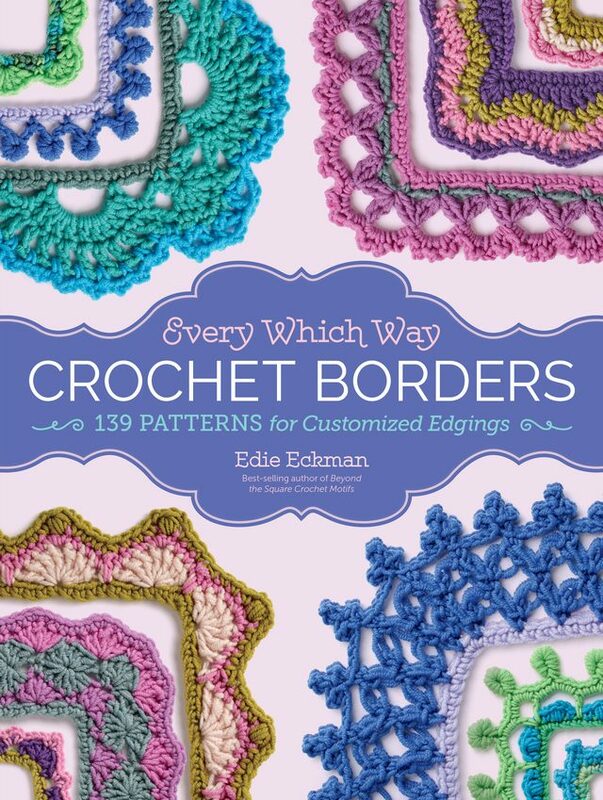 Edie Eckman is one of those great crochet teachers who wears many hats. She has owned a yarn store, worked as a crochet designer for magazines, yarn companies and her own line, served as a crochet magazine editor and a pattern technical editor, and authored crochet and knitting books. She clearly loves the crafts and wants to do as much with them as she can. Working in all of these capacities has broadened her skills beyond just being able to crochet well and into being able to teach the craft to others whether that’s through her classes (like Essential Crochet Techniques and Joining Crochet Motifs, both online Craftsy classes) or through excellent resources like this new book. This is so pretty! I am always looking for new borders for my work. 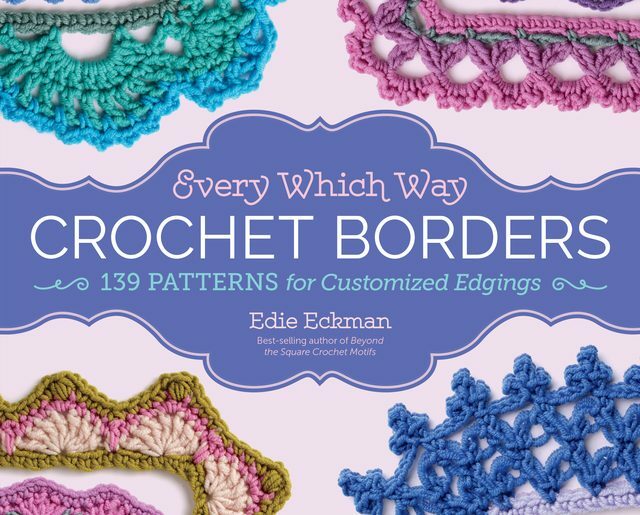 I have Edie’s other border book – Around the Corner Crochet Borders and love it! Of course having the new border book would give me that many more gorgeous borders to choose from! What a lovely giveaway! This would be an excellent addition to my library!!! I am always looking for ways to make simple items more elegant or sweet looking. I usually do this by using a crochet border. Just the few you showed from the book really gets me excited to do something new. I would love to win this book. Thanks for the opportunity! Every blanket, afghan and rug I make receives its own border, whether it’s the border from the pattern or of my own creation. I often ask my coworkers to “vote” on what the item needs, e.g. a Cherry Blossom I created (edged in black) ended with a pale pink lace (1 round) edging, and a floor rug in rasta colors (rounds of dc) was finished with one row of slip stitch. I would love this book for inspiration. I’m always looking for different border types. I already have the author’s other border book, I’m forward to getting this one as well (bought or won). This book would be great to add borders to our blankets that we are making for kids picked up through our local Child Protective Services. Even if I don’t win the book, I will certainly check it out through our local library. Thank you for bringing attention to this book. It will help our endeavors. I could really use some help with my borders! I need some new ideas! I always love Edie’s books and follow her adventures on FB. 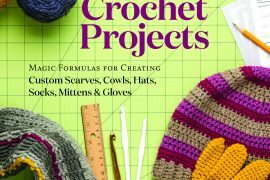 Another great book to add to my crochet library! I’m always looking for new borders to add to my blankets to keep things interesting! I shall, indeed, follow this Blog Tour – would so love a copy of this book! I have “Around the Corner” – and love it….and have wanted MORE from Edie Eckman ever since! Thanks for the chance to win. I would love to have this book in my library because I make a lot of baby blankets. This would be perfect to help make each one unique with their boarder. Simply put….I need all the help I can get to improve my crocheting skills. Winning this books would be a leap forward in knowledge and expertise. I want to assist my children and grandchildren learn an excellent skill to make their lives more enjoyable as it has assisted me in obtaining a sense of fulfillment in my own. I would love to add this newest edition to my crafting library. I have Around the Corner and it is fantastic. This would help me in my quest to be able to add more personal touches to crochet projects. 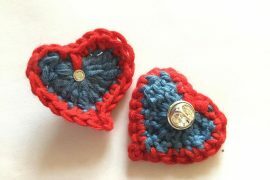 I am currently teaching my Muffins (aka grandkids) how to crochet, they are 8,7 & 5 and this would be an immense help to me. Thank you for the opportunity! I’m just starting out in Crochet and borders is something I’ve not yet tackled but with this I’d soon be an expert! I’m new to crocheting, and this would really help me learn to finish off my projects with amazing touches. Oh la la! I would love to win this book. I’ve been hooking a lot of afghans that could use a cool border. Thank you! This is a fantastic opportunity to improve my crochet projects. I have always found Ms Eckman’s patterns clearly written and easy to follow☺ Thanks much for sharing this pattern with us! I’ve been wanting to edge some fabric scarves and mitten cuffs, this book would be perfect and have lots of options to try. Thanks for the chance to win! I would love to win a copy of this book! Looks great! I would love to add these borders to fleece blankets. It would make them really special. I love learning new stitches and techniques. I would love to win this book! I have Edie Eckman’s other books so would love this to add to my collection. It’s amazing what adding a border can do to a plain pattern. Her designs are so inspired. I always seem to be looking for just the right border. This new book would be a great resource. I love this! Boarders can make or break an entire project. And can I add, all pattern books should be spiral bound. ?? This is great timing for me! I’ve just finished a toddler blanket and it needs a special boarder. I’ve been all over pintrest and ravelry. I’ll be checking these out! I want to find a special border for the afghan I’m making my niece. The afghan itself is a beautiful, but simple stitch and I’d like to accentuate it, but haven’t found the right one yet. I’m sure it’s in this book. I like to come up with my own designs and having a book of borders as reference would be immensely helpful. I am always trying to find an interesting border for my blankets. Thank you for the pattern and the chance to win the book.! I love borders, they add such a finished look to a projrct. What a fabulous book to win! And generous pattern giveaway, thank you. 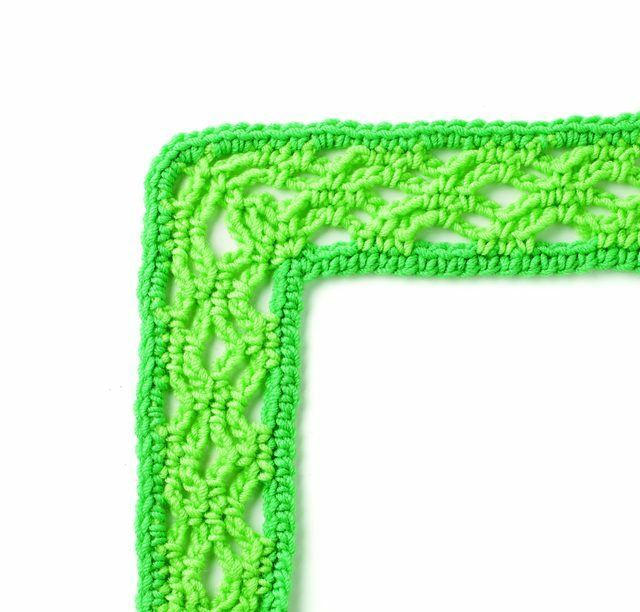 I usually use the same old borders and this goes my mind that there are so many different types of borders to crochet. I would love to win this to be able to experiment with them thanks for the chance! I’m always looking for the perfect border for my latest blanket. I’d love to add this book to my library. I’m working on a shawl that needs a border-this would be perfect to find the best one!